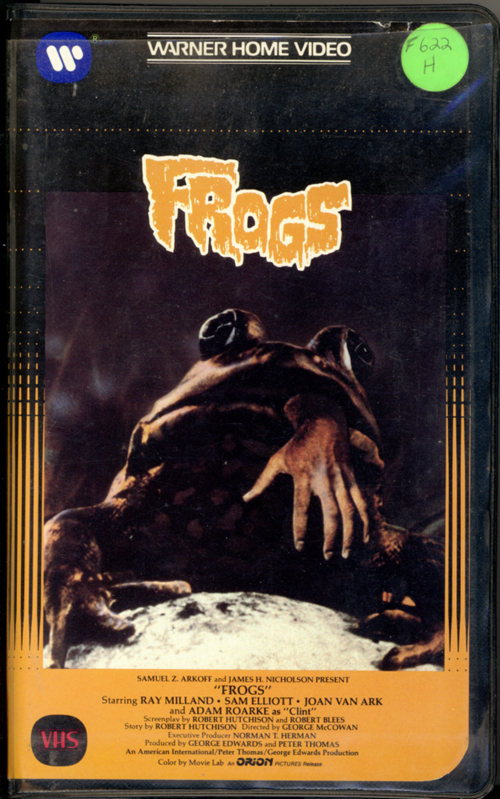 Frogs on VHS. Starring Ray Milland, Sam Elliott, Joan Van Ark, Adam Roarke, Judy Pace, Mae Mercer. Directed by George McCowan. 1972. Everyone knows that man is the dominant species on Earth. Or… is he? “Frogs” is the shudder-inducing answer to that query, a nightmare of what can happen when the denizens of your local swamp decide to strike back at the so-called “intelligent” life form that despoils their environment. In the best horror film tradition, this grisly tale unfolds on an isolated island off the coast of the deep South, where great-grandfather Jason Crockett (Ray Milland) gathers the clan to celebrate his birthday and the Fourth of July. And after family members discover the corpse of the island’s caretaker — who had been spraying poison to limit the expanding frog population — crawling with frogs and snakes, it becomes ominously apparent that the party will have unexpected guests as well. Gate-crashing is subtle at first: the maid and the butler discover a poisonous snake in the dining room, and small bevies of frogs start hopping into the mansion. The festivities only get deadlier after that. One of Jason’s grandsons goes into the woods to repair torn telephone lines and meets an arachnid array that will set you squirming. Another grandson ventures into the greenhouse where some curious lizards have discovered a cache of deadly insecticide. By now, fright fans get the picture: old man Crockett and his brood won’t leave the island alive if Mother Nature’s minions have their say. Who among such stalwart players as Sam Elliot, Joan Van Ark, Adam Roarke, Judy Pace and Mae Mercer will survive this reptilian revenge? It would spoil the party to tell, especially since “Frogs” will not only keep you perched at the edge of your seat but also persuade you to think twice before squashing a bug or swatting a fly again. After all, today the pond… tomorrow the world!